Rocco On Tiger Signing His Photo: "That's just the way he conducts things. That's not him." I finally got around to watching Rocco Mediate's appearance on Feherty and it was as much fun as you'd expect when you put two maniacs in a room in front of cameras. Thankfully this clip of Mediate talking about asking Tiger to personalize a photo and pin sheet was posted online. There's also a seven-minute outtake online where Rocco talks about the state of the game, the First Tee (genius but "where do they go"? ), growing up on muni's and the worst rule in golf. I ran into David Feherty strolling his second home--the DFW airport--and asked him how the Rocco show Monday was and he reported that Mediate was in great spirits. Hardly surprising that those two could yammer up storm about the '08 US Open, Arnold Palmer, the long putter and other stuff, as evidenced by the preview clip. The show first airs Monday, May 13 at 10 pm ET. Rocco On Tiger's Swing: "It doesn't produce the shots he used to hit"
Steve DiMeglio looks at the state of Tiger's game and also features a nice mini-retrospective of the 2008 U.S. Open at Torrey Pines where Woods dueled with Rocco Mediate. Four-plus years later, Mediate still is in awe of Woods but has questions about the state of his mechanics.
" … "I love what Tiger has done for the game... I've always had a ridiculous amount of respect for what he has done. All the crap on the other side I don't care about. I don't know what happened; only he knows what happened." Mediate says something else happened – to Woods' swing. While the jury is still out on whether Woods can again become the dominant force in golf, Mediate is a tad skeptical. "Nothing he did ever surprised me. He's that good. But he can't do it anymore because his golf swing is different. It doesn't produce the shots he used to hit," Mediate says. "Do I think he's finished winning majors? No. Does he have as much desire? Yes. But you could ask him to hit any shot blindfolded back in the day and he could. Now he can't. I know what I'm seeing. I know what I saw before. And it's not the same.
" … I know the things outside of golf hurt him immensely, and the injuries have hurt him ... If he does find the swing again, it's game over. Sad news about the first ever participant in the Golf Digest Challenge passes away nearly a year to the day he played Torrey Pines. "But the answer is, you don't earn that money back." Fay said the USGA had to spend nearly $120,000 for an extra day of buses, $45,000 for the smaller buses, $30,000 for parking, $60,000 for security to stay an extra night and day. Throw in lunches for bus drivers, media, volunteers, parking for the media and travel costs for the USGA staff. "When you round it up, and throw in the ever popular 'miscellaneous,' it came out to $513,000," he said. "Sure, we hope to see a few more hot dogs and beers and shirts. But the answer is, you don't earn that money back." "The stroke that followed will go down as the greatest final-hole putt in the history of major-championship golf." I'm biased because I was standing there and thought the whole thing was pretty swell, but does Jaime have it right? Greatest final hole putt? "Those volunteers ended up making the nonprofits about $7 an hour." Tim Rosaforte files a very enjoyable profile of Rocco Mediate's whirlwind run and finally, someone catches up on the incredible trevails he's gone through in the midst of a couple of other great runs that you likely forgot about. "Tiger's drives were worse than Phil's, yet finished in better spots." James Corrigan talks to Dave Pelz about Phil Mickelson's performance at Torrey Pines and the short game guru offers an interesting theory on the difference between Phil and Tiger's, uh, luck. "I give Tiger all the credit in the world but I'm a stats guy," Pelz said at the opening of one of his renowned short-game schools at Killeen Castle in Co Meath. "I look at Mickelson's worst three drives and he made two doubles and a bogey and then I look at Tiger's worst three drives and he made eagle, birdie, par. Tiger's three-under, Phil's five-over. Tiger's drives were worse than Phil's, yet finished in better spots. "That actually might not be a bad way to do it," he adds. "I mentioned it to Phil. Of course, it's not just luck. It is lucky when a 75-footer hits the hole and goes in, but it's not lucky that he hits it so near to the hole. It might have gone eight foot past but he probably wouldn't have three-putted as he was putting so fine. "Both Opens need to introduce a multi-tiered entry-fee system whereby tour players are charged a sum they may think twice about relinquishing so easily." John Huggan talks to agent Brian Marchbank, who helps explain the WD disease that keeps hitting the U.S. Open and Open Championship international qualifiers. I'm not quite buying this from David Fay in year three of the WD shenanigans. "I want to know what the players are thinking," said Fay. "Why are they entering in the first place? Has something happened? Or are we doing something wrong?" "It took DeBock five tries; the reporter finally found it on his 15th." Not to dwell excessively on the U.S. Open with THE Open lurking, but several moments keep flashing before my eyes and none sticks out more than Tiger's putt on 18 Sunday. I remember looking at downhill putts here after learning that front right would be the likely location, and it just never looked like an easy putt to read with the slope coming off the bunker. Well, Ed Zieralski reports that others have had that putt in mind and tried it out. A student of U.S. Open history with a terrific collection of memorabilia from past events, Torrey Pines head pro Joe DeBock was prodded by a reporter to return to the South's 18th green on June 18, two days after Woods beat Rocco Mediate in a thrilling 19-hole playoff. Of all the putts Woods made during the Open, the reporter told DeBock he was most impressed with a 15-footer that had about eight inches of right-to-left break, which Woods gingerly jarred for birdie to tie Mediate after 72 holes of regulation. DeBock found the hole placement used for Sunday's final round, and he and the reporter took turns trying to make it. It took DeBock five tries; the reporter finally found it on his 15th. “It was a bet for the city of San Diego, because the city didn't have the money to put up for this bet"
While I enjoyed Brent Schrotenboer and Eleanor Yang Su's look at the complex relationship between The Friends of Torrey Pines and the city of San Diego that left the city out of profiting from the U.S. Open, it was hard not to wonder why this question wasn't raised before the Open. And while I'm happy for Jay Rains and the "Friends" who pulled off a stunning success in the face of many hurdles, it was always quite clear that appearance of conflict was there. Only now that the Open was a huge success do the city advocates want a piece of the pie. I say, too late! Anyway, the key numbers, which would seem to back up the Sports Business Journal estimate of a $50 million profit, which David Fay refuted last week. The USGA projected in November that it would generate about $58.3 million in revenues from the 2008 Open, according to a city permit application filed by the association. That includes ticket sales, hospitality, concessions and merchandise. Television rights are not included. Sports Business Journal recently approximated those at $40 million and suggested total revenue might approach $100 million. The USGA estimated its expenses at $51.5 million. For the USGA, at least $58.3 million, plus TV deals. For the Friends, $5.37 million from rent and hospitality shares, interest and a $950,000 reimbursement from the city for some of the course renovations. For the city, about $500,000 in rent from the Friends, plus cost recovery up to $350,000 and another $350,000 for other golf course work. The city also derived other benefits, many of them hard to quantify, such as five days of national television exposure. Additionally, the Friends said they would give the city $300,000 to $500,000 to improve the irrigation system at its golf course in Balboa Park. "The fact that you've not heard anything should not be construed as meaning there's a problem." The bunkers like we have been doing the last few years, we did stir up the bottoms to try to make the bunkers a little bit softer so that the player can't get as much spin. And I was telling somebody the other day, one of the best things I heard at Torrey Pines, it just -- I almost wanted to do a cartwheel is when a player actually said, we were trying to avoid bunkers at Torrey Pines. Because we haven't heard that in who knows how long. You have to have enough risk but you've got to have the reward with it. They have to match. And in fact David and I talked about it before Sunday of Torrey Pines, that I thought it was going to work well for the reasons I kept going through in my mind, but you don't really know. And if only ten players out of the 80 went for it I would call it a failure but I think there was 57 or 56 or whatever that went for it. And it's, you know, there was a blend of scoring. But when we did it at Oakmont it worked. Because those holes were architecturally set up for it. We did it the one hole at Winged Foot. But, no, we will not force it. So it won't necessarily be a trademark. But I think when you get that opportunity, it's really neat because you do make the players think. And we want -- we don't want this to be gimmicky, but at the same time we want it to be the hardest championship of the year, whether it's the U.S. Girls Junior, the Women's Open, the U.S. Open or the Senior Men's Amateur, but at the same time there's nothing wrong with introducing more risk, reward and making the players think, giving them opportunities, and taking a hole and really saying if you play it great you can make birdie, eagle, but if you don't play it so great, if you try something and don't pull it off you're going to pay the price. And look at this troublemaker with the killer follow up about those R&A lollygaggers. Q. David, could we get an update on the groove situation? Wasn't that due for some sort of roll out in January, I think, in theory? Has there been any developments on that front or are we going to have to all change irons? DAVID FAY: The latest update is there's no update. We are still on track, we hope. There are a number of components that we have to get everything resolved. A number of -- and we're moving ahead on that. But to give you a timetable at this time, it would be premature. Q. R & A still a part of the equation in getting them signed up for the same time? DAVID FAY: Well the R & A, it's a change in equipment, a change in any rule will not happen unless both sides support it. Fully. The fact that you've not heard anything should not be construed as meaning there's a problem. It's just that we -- anything dealing with equipment, particularly these days, is complex. You deal with the specifications, manufacturing tolerances, I think that one thing I would say that we have never, at least in my experience at the USGA, researched and done the lab testing and the player testing to the degree that we have with this subject of grooves. Just not enough for the R&A! There's not too much more I can say about the details of the Torrey Pines setup that were not covered in the GolfDigest.com blog or in the Golf World story on No. 14. However I would ask you to consider the potential impact of what Mike Davis and friends accomplished at Torrey Pines. They took a golf course virtually devoid of strategic questions and made it a thinking man's championship that will be remembered for ages. The simple act of moving tees around actually caused players to pause and think. Players could not plan out their club selections in advance (sorry Phil). The fact that this kind of spontaneity and surprise only happens in links golf speaks to just how far the game has drifted from rewarding thought as much as physical skill. Though Davis made it look easy it can be to inject interest, there was a great deal of planning and vision that went into the setup. This doesn't mean anyone should be discouraged from more of this variety in future majors, tour events or local amateur tournaments, just a reminder that a lot of work went into this. Tiger On No. 14 Sunday, Photo courtesy of Rob Matre (click to enlarge)I'm still fascinated that a few observers are making a fuss about the notion that players had to pause and contemplate options at No. 14. That shortening a "solid" hole like the 14th was a terrible sacrifice. Yes, the current 14th is solid. Solidly dull. You hit the fairway, you hit the green and you putt. There are not questions to answer, no decisions to make. Just an obedience examination. Ponder this: I saw only one player the entire day come to No. 14 tee and pull a club before he arrived at the tee markers. Everyone else had a discussion with their caddy or at least took in information before selecting a club. That is the kind of "test" that golf needs more of. Not every hole because they'll never finish, just more often during a round. It also cannot be underestimated how difficult a shot the 267-yard 14th posed and how impressive Rocco's two plays were Sunday and in the playoff. Now that we have evidence of an exciting event owing much of its success to the setup elements--particularly the vulnerability and scoring differential on the par-5s--Mike Davis has proven that options, variety and strategic thinking can offer difficulty that is far more interesting and revealing than tiny landing areas and high rough. Our friend Frank Hannigan, the former USGA Executive Director, wrote after the thrilling U.S. Open to put matters in his unique perspective. 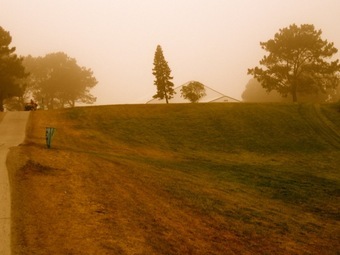 Golf was not invented at Torrey Pines. Nor did it die on Tuesday when Tiger Woods revealed he is badly damaged and can't play for the balance of 2008. Ben Hogan, hit straight on by a fast moving bus, in the winter of 1948, after winning the US Open, had to sit our all of 1949. Golf survived. The four major winners in 1949 were Sam Snead (twice), Bobby Locke and Cary Middlecoff. Moreover, I'm sick of hearing of the huge money game being defined as "golf." As in "Golf is in dreadful shape with Tiger out. The British Open might just as well be Quad Cities. By the way, golf has been stagnant during the era of Tiger Woods in terms of rounds played or golf balls sold. In Hogan's best days, golf boomed. I'm not ready to acknowledge that Tiger is the best player ever. America has produced four incredible golfers: Bobby Jones, Hogan and Jack Nicklaus. Jones was such an anomaly it's impossible to compare him with anyone. He was an amateur who stopped playing competitive golf at age 28. While he was the best player in world - way in front of Sarazen and Hagen - he picked up degrees from Georgia Tech (engineering), Harvard (English Lit) and Emory (Law). Two years later, with no special enthusiasm, Hogan went on to his lone British Open and won at Carnoustie. He took nearly a week to reach Great Britain by ship. Few Americans played. But let's pose a counter factual: suppose there were jets so that Hogan could play in every British Open from 1946 through 1960. (He had missed 1942 through 1945 because of World War II. ) I do believe he would have won some. As for Nicklaus, with his 18 majors and 19 runner-ups in majors, I resort to another hypothetical. It is that Tiger Woods comes along in 1970 rather than in the late 90s. Nicklaus just might have revved up his game a little. He was the most competitive man I ever met. He thought he should win everything. In his later years, he played with Greg Norman as his partner in one those silly season events. They were way behind after 3 rounds. Nicklaus peered at the scoreboard in our ABC booth and allowed as how they could get right back in it by shooting about 51 in the last round in a scramble format. Norman looked at Jack as if he was crazy. Jack had an approach based on his belief that only 5 or 6 other players could stand the heat in the final round of a major whereas "I can always play my game". In my opinion, that's why he was runner-up so often. He would be a touch cautious, get behind after 3 rounds and then come roaring back Too late. In a technical sense, Nicklaus was in relative terms and considering the change in equipment, about the same length as Tiger but infinitely straighter. Jack was an astonishing fairway wood player. Alas, there are no fairway wood (or metal) shots today. Their iron play was equally terrific. It is accepted that Tiger is the world's best putter. Nicklaus was not bad. The late David Marr and others regarded Jack as the best putter in his glory days. Tiger is miles ahead when it comes to playing from 120 yards on in. Lee Trevino said "God gave Jack everything except a wedge." Though I continue to think Jack would have improved his short game if it had been necessary to play against Tiger. We hope for a complete recovery for Tiger. When he returns it will be said on ESPN that he has reinvented the game. What actually happened last week was a young man on the USGA staff, Mike Davis, just about turned water into wine in preparing Torrrey Pines. It is a golf course that is not and never will be exceptional. What I learned is that, given a few million dollars and enough property to expand the course to 7,400 yards, Mike Davis could make any of hundreds of courses pass as US Open courses. Considering the justifiable praise Mike Davis earned last week, it could be that he will be tempted other entities with even more money than the USGA has. I would caution him: be careful. It's not so easy out in the real world. Because I know how much you love to hear writers complain about getting free food, a free pass (sometimes inside the ropes), free merchandise (they bribed us with a pair of Maui Jims! ), free internet access and a cushy shuttle drive to the course...I'll just stick with one gripe. 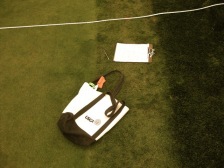 - The USGA put the media tent on the second fairway of the North Course and trapped it with a row of corporate tents lining the first fairway. This meant it would take 10-12 minutes of walking just to see any action on the golf course unless you cut through one of the tents like I did most of the week (by the time they realized I was intruding, I was out the front door...). The Media Center lurking like the view from Bates Motel up to mom's house (click to enlarge)When I mentioned to David Fay that it was a great week except for the location of the media center, he said that as he was walking up the steep hill the tent reminded him of the view from the Bates Motel looking up to mom's haunted house. He was right about that (see photo). When the Open returns in 2017 or 18, let's put the media center to the right of the range next to the player locker room and leave the cool ocean view (that we never got to see) for the overpaying patrons. - IBM scoring. Various Open vets declared it a disaster. The round one scores did not make most national newspapers east of the Mississippi and by all accounts, the Unysis system of the past was faster and more efficient. Also, based on the comments in threads here, the website was a step back in terms of function and reliability. Alright, off I go in my Maui Jims. "Scooped it up in a empty beer cup, as not to disrupt the DNA, Ive got lots of witness'...all moneys go to my daughters college fund"
Some people go to the merchandise tent and buy a hat, others pick up Tiger Woods-discarded apple cores and put them on ebay. And you wonder why he has a boat called Privacy? "He would hit four or five balls, then limp to the cart for a rest." John Huggan gets Hank Haney to talk about the weeks leading up to the Open and Tiger's knee prognosis. "Three weeks before the US Open he couldn't walk. It was about then he started hitting balls and trying to play a little bit. I watched him practise. He would hit four or five balls, then limp to the cart for a rest. He'd sit down for a few minutes, then limp back to the balls and hit four or five more. That was all he could do. "His feeling was that he had to play in the Memorial because he was so rusty. But he couldn't walk from the kitchen to the dining room table without bending over, he was in so much pain. So there was no way he could play." With the Memorial proving a tournament too soon, Woods' mind then shifted to the possibility of making it to the US Open. "He started playing a little bit, but never more than a few holes at a time and always in a cart," recalls Haney. "In fact, he didn't play more than 72 holes total between the Masters and the US Open. When we went to Torrey Pines the weekend before the tournament I told him he had to try and walk at least nine holes. Just to see if he could do it. "So I drove the cart and he walked nine holes. He made it, but only just. I was asking him if he could bend down to read putts. He said, as he always does, 'I'll be all right.' But I made him do it. So he tried. He could get down okay, but he had to lean on his putter to get back up again. Even then he was still saying he'd be all right! "Anyway, he walked nine holes on the Sunday, then nine more on the Monday. And he couldn't hit more than 50 balls on either day. Whether he was going to play was in doubt right up to the last minute." “I would hope it would be teed up pretty good"
The USGA will consider those courses at its October championships and executive committee meetings in New Jersey. Based on the commercial and theatrical success of the 108th Open, however, Torrey Pines could also be considered for fast-track approval. “It's unusual, but not unheard of, to select three U.S. Open sites at one meeting,” Fay said yesterday via e-mail. Site selection, Fay cautioned, is only a first step. The USGA customarily withholds announcing its decisions until a formal agreement can be negotiated with prospective tournament hosts. Given the additional complexities involved in haggling with city government as well as the various private enterprises that operate at Torrey Pines, those negotiations could turn tricky. Still, the success of this year's tournament was so great that the USGA may want to ponder pushing another site back a year in order to accelerate its Torrey Pines timetable. After all, a PGA Championship in San Diego in August has a nice ring to it, doesn't it? Whether auditors will conclude that the city broke even on the 2008 Open will depend on the size of their imagination. The city stands to collect only $500,000 in cash for an event that could be worth up to $50 million in profits to the USGA, according to Street & Smith's Sports Business Journal. Though Fay says that estimate is a distortion – “the guy who parsed the numbers together for Sports Business should receive an advanced degree for making accounting a creative art!” he wrote – the USGA typically books enough profit to pay millions to the Open site. The Friends of Torrey Pines, the donors who made the Open possible by funding the renovations that raised Torrey Pines' South Course to USGA standards, should have no role in the next round of negotiations. Eliminating these middlemen – well-intentioned though they were – means the city should be able to deal directly with the USGA and therefore reap a larger piece of the proceeds.